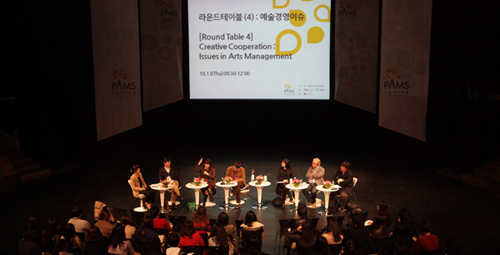 The following are the excerpts of the discussions among our domestic and overseas editors opined during Round Table 4 at the Performing Arts Market in Seoul 2011. Hyun-mi YANG (“YANG”) : In this meeting, we will discuss issues upon the topic “Issues in Global Arts Management: What Are the Concerns of Arts Managers Today?” Our domestic and oversea editors have selected 10 issues. One or two members of our panel will explain and comment on each issue. The first issue we will discuss is about the continuing shortage of financial resources, especially that of public support. The financial hardship is spreading across Europe and the United States, and the dwindling amounts require more accountability for how they are spent. Ching-Lee Goh (“Goh”) : Asia has advanced significantly during last decade. This economic advance propelled cultural advance as well. But I’m not hinting that Singapore spent a lot on arts and culture. It was too meager to cut back. That was how the budget was intact during the last economic crisis. We involved in arts management have to think about the matter. Crisis after crisis returns, and economic stability gets shorter and shorter in duration. Meanwhile, people will pay more attention to the role arts projects carry out in society. Projects that focus social values will command our priority. The National Arts Council of Singapore is likely to spend a large portion of its budget on community arts. State-run and small-sized companies are also eligible for the funding. The tendency is prevalent in other Asian countries, I believe. The focus will be probably on artistic quality and, at the same time, on other matters like audience participation, enlargement of audiences and community service. In the future, more and more importance will be put on how arts contribute to communities, and accommodate special needs of each community. These changes, however, may pose a risk of getting more conservative and isolated. François Colbert (“Colbert”) : For the past 50 years, artists and their groups have dramatically increased. The Canada Council for the Arts had a hard time securing necessary resources. But Canada hasn’t downsized it. Its public funding increased from 7 billion dollars to 8 billion. The same is true of France and Germany. They haven’t downsized public funding. The situation is little different in the United States. America does not have any public pool of supporting resources The entry barrier is petty low in arts. Numerous colleges produce artists, and they try to make money through artistic activities. What face Canada and other Western countries is the hallucination that these countries produce more artists. They have more means. Now, Canada can’t afford all the artists and groups. They are simply too many in number. I don’t think there is a macroeconomic silver bullet. But we can’t shut down all the arts colleges. People with artistic background should keep coming out. Society needs creative people. It would be really absurd to shut them down. Some Canadians complain we have too many colleges. That’s not it. We can’t shut down schools, and actually should not. In Canada, artists can live by doing what they are supposed to do. Actually, the same is true of other careers. Lawyers do the same. “Projects that focus social values will command our priority. YANG : We discussed situations in Asia and North America. To illustrate the conditions in Europe, let me introduce recent data. According to the data, the economic situation has swept entire Europe, and got worsened around 2010. Among the countries, the budget cut directly affected the Netherlands. The Dutch government had supported 90% of all the money required for arts and culture activities for the past 40 years. As a result, new artists performed under stable circumstances. In the past, the government poured 900 million euro on average a year. It nose-dived to 200 million last year. Especially, the performing arts industry took the brunt. The situation may vary from nation to nation. But it is worse in several European countries. Now, let us talk about the Korean situation. Sung-yeop LEE (“LEE”) : It’s a heavy topic. Money was and is always in need, and that is the biggest problem. The shortage is same here as in overseas. Money was in need, and now more in demand. We feel shorter. I guess it’s because European and other countries dramatically cut down on arts and other social welfare budgets. Looking back on the past 20 years, what is worth our attention is the fact that the market as a whole has considerably expanded, and the public factor propelled the expansion. As in other areas, public support for this area stopped increasing during the past several years. Particularly, artists complain of lack of public funding. But it’s not about how much, but more about how it is distributed. Especially, this administration proposed a new support system, and a considerable number of changes followed upon the policy. What artists complain of most is the dwindling size of support and the way the money is spent. Actually, it differs from what the panels discussed right before. YANG : As to the central government, the budget does not change much. The story is different when it comes to localities. In the Gyeonggi Province which is the home to more than one fifth of the entire national population, five public museums have been established for the last four years. But they reportedly lacked the funds to acquire exhibit items. The provincial government simply did not earmark money for that. How about the situation there? Se Hyung OH (“OH”) : Temporary shortage may not threaten much. What’s really threatening is the long-term budget decrease. In the past, funding for projects and operation was relatively stable. The entire structure was healthy. Regardless of the national budget structure, the provincial funds have been shrinking. Eligible items have been changed. Contrary to the trend, municipal and county supports for arts have almost doubled. It translates that municipal support has taken up the place where abundant provincial support had left. Municipalities discuss issues like what to choose and where to concentrate their resources. What we need is how to adjust the role played by the province-run organizations. It would be fair to say that not the budget itself, but the way it is distributed has changed. Nathalie Boseul SHIN (“SHIN”) : Visual arts seem to be getting less and less of the pie. It is almost impossible for individual artists to obtain public funding. On the contrary, organization-based support has dramatically increased. Filling out the application form last time, the available size of fund really surprised me. One could obtain up to 500 million Korean won. But it came with a condition. The exhibit had to be with international artists. Written consents had to be submitted along with the application. Then, only birds of a feather flock together. In addition, instructions flip-flopped overnight. Then, our plan flip-flopped as well. The biggest problem is not the shortage of funds. The pool of funds has got enlarged. The problem is we don’t have much time for planning how to spend the funds. “Particularly, artists complain of public funding. YANG : Artists and those in management should adjust themselves to a variety of changes like budget reduction and methods of support. The changes seem prominent especially regarding public funding. The next issue we’d like to discuss is the post-funding process. How do the public-funded arts organizations operate? Support seems wading out for alternative or experimental organizations. SHIN : All the entities I have worked for happened to be non-profit ones. It wasn’t my intentions. But I’ve been with diverse organizations, except galleries. We filed project-based applications to get funding. But it hasn’t changed much for last ten years. Now, I work for a private art museum. It’s been a 30-year old family business. I can’t think of any outside income whatsoever. Family members pay for its operation, and the director pays bills. All projects run off public funds. What’s troubling is its dependence on public funding. Every function has to be sizable to get the funds. The entire staff numbers are only three. They handle international exhibits three to four times a year, which drives them nuts. But without it, the art museum will not exhibit anything, but conduct researches. These days, we are displaying Rumanian artist Dan Perjovschi’s works. What’s interesting is people come for the exhibit. But arts experts and artists seldom do. This is very rare. One more interesting thing is their reaction to admission fees. We charge 9,000 won (approximately, $8) per person. It’s the highest ever for our exhibitions. But people think it’s modest. On the other hand, artists and experts think it’s too high. They even complain of the money we charge for leaflets. Yesterday, our staff members got together sort of to discuss these reactions. The meeting concluded on a special discount for artists and experts. In a nutshell, artists and experts believe admission should be free. Because we are a non-profit organization. It is taken for granted that a non-profit organization doesn’t give a much of fund to artists. Free lunch! We took it and still take it for granted. We seem to believe we have to take care of each other, simply because we are not well-to-do and we know each other. We’re still fiddling with various ideas. Not time to propose any solution. But this way, in 10 to 20 years, we won’t be able to talk about Korean modern arts. Now, Korean artists engage in diverse activities overseas, and have won praises there. Looking back on their early days, they were produced by alternative spaces in the ‘90s. Working along with program directors of non-profit entities, they are now, in their 40s and 50s, making their names overseas. Recent graduates go directly to art fairs. They are too familiar with the market. They just lack of challenges. When teaching in college, students often ask what they should do and what type of job they get to be an art dealer. But seldom do they ask how and what they will design and produce. Suppose this trend without alternative spaces continues for 10 years to come. Could we think of any future? lroo JOO (“JOO”) : Working, depending on public funding, is difficult. Lots of conditions are attached, and too much paperwork is required. But the funding doesn’t cover paychecks and bills. It’s actually what government agencies should do, but they don’t pay us a dime for that. Of course, we understand it’s part of taxpayers’ money. So, results must be produced. Without the consent, and without showing details of spending, we can’t use the funds. This way of funding, however, puts a wedge between what has to be done and what is supposed to be done. Lack of concentration! In addition, when using the tax money, they concentrate it on proven works or projects. It seems sound to pick artistically excellent people, just like in selecting track runners. But that’s not always the case in arts. There should be empty space in the artistic biological environment. Different things of different qualities should cohabitate in there. That way, creativity begins to breathe. What’s really bothering about public funding is not the fluctuating size of the budget. It’s about how to choose what to be funded. The private sector should find out how to survive in the market. It should locate ways to pay for operation and paychecks. It would be great if people with diverse or great tastes chip in. Then, we will appreciate diverse forms of arts. But the gratuity in Korea is scare, and we have to depend more on public funding. Considering the conditions and the environment for use of public funds, it’s no wonder artistic diversity diminishes. Also diminishing is the breathing soil for artistic creativity. It’s natural to choose talented some over the army of artist wannabes. But the way they choose the “talented” based on their own criteria, I wonder promising future of arts will ever come true and the biological environment will ever continue. Size of public support matters, of course. But what also matters is how it should be distributed. YANG : Let’s think about the domestic situation. There’s a biannual national survey titled “Survey on the actual condition of culture and arts industry.” One of the questions asks whether one has ever received public funding. About 15% of the respondents answered they had received funding [from central and local governments or special funds]. Only 3-4% of the participants replied they had received corporate sponsorship. What it means, we haven’t many resources in the private sector. The public sector fills the gap. So, the entire artist community is prone to changes to public funding, whether it’s about amount or whether it’s about the way of distribution. The problem is a lot severe in the non-profit area. Goh : Let’s take a Singaporean company for example. Theater Company fills 20-50% of its budget with public funds. It has a well-organized network of corporate sponsorship. It occupies 30-40% of the company budget. On top of it, the taxation is also good. Donations are credited twice including the general initial deduction. I’m not sure whether the Korean government gives credit to corporate donations. LEE : For us Koreans, it matters how much donation to entice from the private sector and how much to expand it. The Korean government also allows tax deductions for donations to the specialized arts organizations or corporate expenses on cultural items. I don’t think it’s lack of systematic mechanisms. What actually matters is the cultural and social differences. Looking at Western countries, we press for more donations. I don’t think that’s the way it should be. SHIN : That’s true. We have tax deductions. But what we have found out is that corporations choose to build new art museums, rather than sponsor existing ones. A same system may be used differently in distinct cultural settings. We are very concerned. Public funding has great impacts on artistic diversity. All art museums fund their projects with public resources. Some of them are socially very sensitive. Actually, five foreign artists and five program organizers, along with eight other Korean artists and their family members, went on a trip to the Nakdong River. To put details on a project we had conceived, we had agreed to trot along the river from its upper source to Busan. There was a tense feeling running among the artists. We were concerned whether it would be OK to use the public funds, since the river is part of the Four River Project. We were afraid it might bump into problems. [The administration has launched the project to remake four longest rivers in South Korea, or the Han River, the Yeongsan River, the Geum River and the Nakdong River. Some liberal groups have railed against it, alleging environmental problems.] Fortunately, we came up with a solution. We decided to use the mechanism of crowd funding, and it worked. But let’s think about it this way. Let’s suppose our project was critical of the government project. If that had been the case, would the administration have funded it? Under these circumstances, one of the possible solutions would be to advertise our project as the one to promote our rivers and mountains overseas. One way the other, we could possibly put the projects in practice in the end. When it comes to free expression, it is true the idea of free expression is constrained somehow, if one wishes to use public funds. YANG : We started with the issue of dwindling funding. That issue seems limited to some countries, I guess. The real issue hinges on how to use public resources and what to support. Politics considerably influences arts. And the influence dictates issues like what direction to take, what supports to give and how to support. Artists balk at politically sensitive topics, pressured by unspoken constraints. I’d like to discuss these issues. LEE : These issues recall conflict and conspiracy between church and state. Like that, arts and culture carries that importance. In the public sector, arts and culture has expanded a lot, and lots of public agencies covering this field have sprung up. The central and local governments appoint the heads of these organizations. We’ve already talked about the expanding public funding and arts market of the last 20 years. Accompanying that, the public influence has rapidly escalated. And the governments appoint the heads. On the other hand, thinking about the governments, local or central, democracy has rooted in our society, and one of the prominent symbols is the peaceful change of administrations. The presidential election three years ago and the last year’s local elections changed those in power. The change stirred up turmoil, or rather a scandal in the arts and culture community. When this administration took office, major posts were changed. Chairman of the Arts Council Korea and the director of the National Museum of Contemporary Arts, Korea got fired, along with the president of the Korea National University of Arts. In these three cases, the government lost lawsuits brought by the fired heads. That’s why I call it a scandal. A similar turmoil swept local government-run organizations, when the ruling party lost most of local seats to the opposition parties. Looking at these incidents, we are faced with two positions. Some argue that arts and culture organizations should be led by those who share policies and values of the election winners. On the contrary, others argue for independence of arts and culture. These pros and cons highlight the grave ramifications government agencies have on the entire domain of arts and culture. The same is true of individual artists and groups. Politically and culturally, Koreans had rarely experienced this type of changes. That’s why it’s more confusing. We have three elections in a row, or the mayoral by-election for the city of Seoul, and the presidential and the general elections. Considering the past, yet another waves of turmoil will probably follow. We’d like to hear your opinions on whether it would be good to allow the changes or to isolate the community from them. YANG : Under the last administration, Korean Culture and Arts Foundation was transformed as the Arts Council Korea. Operating under the “at arm’s length” principle, we expected the council to protect its independence in allocating public funds for arts purposes against political influences. The principle does not function properly, I’m afraid. We don’t know it’s because of the peculiar Korean situations or its original nature. Change of power changes a lot. Colbert : In 1957 when the Canada Council for the Arts was founded, the “arm’s length” principle was weak. But it got strengthened later. Artists tried to stay away from power. As a result, the head of the council remains unchanged, even when a new cabinet takes place. The head remains in office throughout her entire term. A new administration doesn’t mean a new council chairperson. If there’s any pressure on the council from the government, it will make the headline. Except the UK, European countries do not have the arts council or similar bodies. In France, the government calls the shot. But freedom of European artists is guaranteed. Maybe it’s because of the cultural difference between the West and the East. Western countries take it that artists as individual deserve the freedom of expression. Actually, Germany stipulates it in the Constitution. The law prohibits forcing any actions upon artists. It protects their rights. I guess Asia takes it as an act of community, not as individual act. Goh : When Singapore first set up its arts council 13 years ago, the arm’s length principle was set up as well. But its width has narrowed ever since, I guess. Every time a new administration takes office, the council chairperson doesn’t always necessarily change. Still, the government wields heavy influence. President of Singapore’s representative theater Esplanade holds the office of the council’s chairperson. Colbert : Of course, this could happen in Canada. The principle is losing grounds indeed in the UK. I think the previous comparison is very interesting. The conflict between religion and monarch, and that between church and state. Now, it seems between individual artists and government. JOO : Indeed political changes affect not only arts but all the aspects of our lives. The changes pose bigger problems in arts, because they suddenly put an abrupt end to ongoing things, severing continuity. It’s also partially due to the expansion of public funding and its role. Publicly funded organizations and agencies now wish to dictate how things are executed. They are not supporting arts. They themselves try to do arts. If that gets realized, numerous private entities in Korea will lose control over operation to public agencies. They’ve already been losing competitive edge. If that continues, politically sensitive public organizations act sensitively on political changes, and even abruptly stop ongoing projects. The cycle makes the entire industry more prone to political changes. The logic behind it is pretty simple. They (i.e. organizations in the private sector) wasted or abused public funds. If that’s the case, we should use the money for public purposes. Strict scrutiny is appropriately. But we need to consider which one throws a graver concern: support after determining a better way of distributing resources, or control over how the resources are executed. If we concentrate on how public resources are better distributed, it might be impossible to eliminate political influence from management of arts organizations. That way, I believe it could minimize occurrence of similar problems and foster a durable ecological system of arts. We need to concentrate on how public resources are better distributed. That way, I believe it could minimize occurrence of similar problems regarding budget allocation and foster a durable ecological system of arts, even though it might be impossible to totally eliminate political influence from management of arts organizations. YANG : When the resources are rapidly dwindling, those in charge of management will agonize most. When eligibilities change, they have to change their plans and modify applications. Considering a staff member in arts management a worker, her status is pretty low, I would say. Arts management attracts lots of students, and they study it in college. It’s a kind of odd job in Korea. How about discussing this here? LEE : About a month ago, the government released its report on nationwide private colleges. The report listed the “unhealthy” colleges, and they are subject to restructuring. The list contained the name of a well-known arts college. This college focuses on fine arts, and it is well known among artists. Nonetheless, it was branded as an ill-qualified one. It was all because of jobs rates. The rating depended on how many of its graduates took jobs, jobs that cover for workmen’s, medical and other major insurance coverage. The problem is our reality. The situation is a little better for arts managers. It’s not that different. And there was another scandal last June concerning the welfare act for artists. The act is commonly called the “Go-eun Choi” Act, referring to the late screenwriter who died, suffering from diseases and miserable living conditions. At that time, the National Assembly and its committees agreed to pass it. But at the last ditch, the labor ministry put a brake on it. The ministry cited conflicting provisions in the legislation, which would qualify artists for unemployment benefits. Under the current law, artists don’t belong to the category of worker, since “a person is not eligible for said benefits, if he or she is not an employee under control of an employer. Therefore, those who work on a project basis without a solid employment do not fall in the category of worker.” In Korea, the provision disqualifies those who work more like workers. For example, caddies, insurance salespersons, drivers of concrete mixer trucks, just to name a few. They all are ineligible. Thus, the ministry probably thought about the social costs of recognizing artists as workers. The legislation was supposed to pass muster in August, but finally passed the parliament without the unemployment benefits provision on October 28 this year. Seven to eight years ago, death of an artist triggered social discussions on the legal status and welfare of artists. It was promising full-time sculptor Bon-ju Goo. When he died in 2003, Samsung Fire and Marine Insurance insisted on application of the criteria for the unemployed. That incident triggered discussions on artists’ collective status and welfare. Two arguments apply to their welfare. Assuming social conveniences given by arts for better quality of life, public attitude toward arts has remarkably changed since the ‘90s. On the contrary to the trend, artistic activities stay away from commercial well being, partly due to the nature of arts. Moreover, artists are forced outside the basic social safety nets. If we take it for granted that artistic activities provide social benefits, it sounds natural for society to bear some of the burdens necessary for their survival. But as the two previous cases demonstrate, our society seems not that mature enough to provide concrete welfare systems for artists. Or, maybe, the pain is transitional. I am not sure which one is our case. Colbert : Canada does have a law specifying the legal status of artists. But it’s not about those in charge of arts management. But the latter are treated just like any other types of workers. And their basic rights are protected. Nothing more, nothing less than any other workers. Actually, artists are always on the front, and arts managers are on the sort of home front. Some artists know they are necessary, but they seemingly don’t understand their importance. OH : Arts managers are geographically concentrated. Actually, I majored in it. But I have seen lots of my friends isolated in many areas. What it means is expansion of arts management hasn’t been grafted in the real field. Before getting jobs, students in that major should be armed with what are required in real life. But they get confused and defensive in reality. Our country is centralized, and it is same with culture itself. We talk a lot about local governance and the government sends lots of money to localities. But it seems to take a lot of time to see local cultures in full bloom. We bump into numerous seemingly wonderful art centers, museums and foundations across the nation. The gap between Seoul and localities is unimaginably wide, though. Qualified professionals still prefer to work at the center. They don’t like working in local areas. What’s more troubling is the excessive pool of relevant professionals. In real life, the demand is not that high. Still, colleges produce too many students. Nonetheless, local culture organizations and groups are in need of specialized individuals. Those with master’s or more get jobs with organizations promising better systems and conditions. They seldom get jobs in local communities. So, personal relationships or motivations lure people into local areas. For example, some come down for poor health, and others for fascination with dedication of her friends working down there. But no one comes down out of positive combination of qualification with willingness and desire. As Director Goh previously mentioned, more and more support will be earmarked for community arts, and higher demand will follow for supporting and management systems to fulfill the social role of arts. Concerning this area, what we need is not high professionalism, but comprehensiveness. Actually, arts, program organizing and arts management are intermingled. Still, college curriculum treats them differently. Recently, planning projects off public funding began to require artists to be armed with administrative, planning, artistic and critical capabilities. Let’s take an example of the project, Traditional Market Revitalization through Culture. To revive and promote traditional markets by use of cultural means, administers should be able to handle all aspects of it: cleaning, quality program planning, artistic competence, and capabilities to communicate, especially with local residents. We also have to think about the gap between the demanded capabilities and the actually acquired role. Nonetheless, more public projects don’t seem to promote human pools for local organizations. For these projects, experts tend to set up organizing bodies with artists and administers in partnership with the central or the local governments. Naturally, local artists and groups suffer from the feeling of isolation. Solutions to these problems would not come up overnight. But, our college curriculum hopefully reflects them in it. YANG : In a nutshell, supply is larger than demand. Arts managers are not found where they are in need. They all want to get similar jobs with commonly targeted organizations. In Korea, the demand for arts and culture is higher in local municipalities than in central or local metropolitan areas. As a result, new facilities spring up with more funding. But qualified professionals balk at going down to local areas despite the increasing demand. Even when down there, they don’t settle there. Now, it’s time for arts managers to pay more attention to local communities. That’s it for now. Let’s change the subject. Working in local settings, managers have to maintain good terms with artists, supporting agencies and local residents. In this context, the communication capability is what’s needed of them most. Why don’t we discuss topics like what problems they face working with artists, how artists perceive them, what problems they face communicating with artists, and what differences they have from artists. Goh : Artists tend to spend a large chunk of budget on creation-related activities. Spending shouldn’t go beyond the budget, but they spend a lot. Managers have to control spending, and that’s where conflicts emerge. They have to account for the budget, but it is artists who actually spend the money. Artistic directors or producers may feel like gods, and they try to put everything under their control. But it’s plainly old-fashioned and wrong. From my experience, I can tell the roles of artists, directors and managing administers are being differentiated. And their bosses seem to make conscious decisions on who to manage and who to create. When appointing directors, the organization heads prefer those who can handle not only arts but also program planning. Especially, planning a festival, an artistic director should be able to perform the role of CEO as well. Directors should be able to spend budgets wisely, while planning programs. Running organizations and managing human resources, these capabilities should come hand in hand with arts. And college curriculum should be geared up to the demands. Colbert : Fresh off college, arts management graduates find it hard to get decent jobs. Arts organizations complain of shortage of human resources. But they don’t give opportunities for the rookies to get trained. For the past 10-15 years, more training courses have been provided and human resources grown in size. But seasoned professionals show concern about young guys. They seem doubtful whether young guys do their jobs nicely. Naturally, therefore, young people face entry barriers. The lower the barriers, the better future the entire industry will have. Goh : For the present, it’s very tough for the young arts managers to enter the market. The industry is not growing now. That’s why it’s tougher. In a situation like this, it’s better to move vertically than horizontally. For experienced professionals like me, it’s easy to move up. But it’s another story for fledgling young guys. Experienced professionals shouldn’t fear young guys. We should believe they’ve got enough training, and help them do their works. We should believe they could overcome difficulties as time goes by. Under these circumstances, we have to brave the storm. We need courage now.